Una caja de cenizas, el Estado y la prÃ³xima revoluciÃ³n en Cuba. Cuba without Fidel Castro. The thought that has been simmering alike in the minds of his supporters and enemies for many years has become a reality. Requiring little effort to sense it, the fact was perceived in public silence against the imposing state machinery of national grief. Official spokespersons have been insisting that this silence is an expression of mass dismay. The opposition have emphasised that the silence is but another sign of fear of repression of those who would otherwise celebrate the death of Fidel Castro during the official mourning. But dismay or repressed joy were the not the only things that have been felt in Cuba in this moment. Chatting with neighbours, friends, family members and random people on the street we were certain that the death of Fidel Castro could be transcendent for Cuba, for the world, and even for so-called “universal history”, but at the same time that this news would have little practical consequence on the oppression of daily life without hope that, like everywhere, we live in dependant on the extent of wage slavery. Implementation of this type of socialism in Cuba has had a longer story than the one the Castro family have been telling us. The previous dictator, Fulgencio Batista, made a fundamental contribution to the authoritarian socialism of The Island, as clearly expressed in the paragraph above, which if we continue to ignore, we cannot have a precise idea of the historical function of Fidel Castro in the history of Cuba. On 20th November 2017 it will be 80 years since the date of the first political event aimed at the people, summoned and organised by Colonel-Sergeant Fulgencio Batista, where the Secretary of Work ordered mandatory service from all public employees from Havana and the army was allowed to confiscate trains, lorries, trams, cars, etc. to gather 60-80,000 people in La Tropical Stadium, used as propaganda to promote the then triennial plan of the previous dictator . That was the first act in Cuba that would become a technology of permanent mass mobilisation for the exclusive interest of the Cuban state, which would then be managed for more than half a century with such skill by Fidel Castro. What in 1937 was a meaningless small authoritarian initiative in 1959 became an everyday tool and presently involves all institutions and millions of people around the country. The government procedures initiated by Batista then inherited and developed to perfection by Fidel Castro leaves, in his death, the gates wide open for candidate successors to rediscover, with surprise, that the most authentic political thinking of Batista and the contribution of his commandant were shared by both governments in order to gain control of Cuba through the machinery of the nation state. If Fulgencio Batista did not have the courage, ambition or opportunity to break relations with the predominant Yankee empire and to make the national state a reality, Fidel Castro had the boldness and historical circumstances in his favour to defy the direct dominance of the U.S. over Cuba. Under the sublime effect of that colossal purpose, added to a Machiavellian arrogance, he managed to convert the state into a system. The simple phrase of Batista “socialism under the discipline of a government” survived the disaster of the last half century to be converted into a Cuban state of such imposing machinery that it had no reservation in declaring on the 1st May 2008 that, “socialism is the national sovereignty, meaningâ€¦ national socialism”. Not only was Fidel Castro the great architect of “the revolution”, but, and this is something that his millions of acolytes cannot define with precision yet, his is most obviously the Stalinist version of welfare state in Cuba, a model of governmental works that emerged from the particular setting of the Island in the Cold war scene, as a privileged ally of the Soviet Union in Latin America, which allowed the Cuban state to use exceptional resources to launch emblematic programs of integrated education from pre-school up to higher education level, free universal healthcare system, employment, great urbanization and fundamental civil improvement for the millions of people excluded by the neo-colonial capitalism that has distinguished Cuba with the rest of the countries of the regions. As in all places where this type of policy was implemented, it allowed a substantial improvement of the level of the population’s quality of life, but with it and at the same time a strategic intention, a strengthening of state institutions, that have conducted a true grand finale of the welfare of the Cuban state. But Fidel Castro did more than the use of quantitative resources that were acquired from the privileged relation with the Soviet Union. He converted the Cuban state into an influential actor on international politics – including the decolonization of Africa and Asia and the expansion of the anti-imperialist movements in Latin America – making Cuba an activist epicentre for those with socialist tendencies who were not alienated to Soviet predominance. After the fall of the Soviet empire, Fidel Castro and his immense international prestige resurrected a new anti-neoliberal movement in Latin America, some of which became governments in important countries of the region, and along with this the realisation of a Cuban State health services programme for the excluded of the world which took a lot of Cuban medics to remote places such as the Pakistani Himalayas or places nearer to Cuba like Haiti. Nevertheless, we have to consider that all these anti-colonial and anti-neoliberal movements that Fidel Castro sponsored from Cuba have found themselves, in the past 15 years, to be in a deep political, moral and epistemological crisis: from South Africa, Angola, Algeria to Venezuela, Brazil, Argentina and on the road to that crisis Nicaragua, Ecuador, Bolivia, El Salvador and Vietnam. And today, for third world countries, that unprecedented and admirable program of Cuban medical services is a major source of income of the Fidelist bourgeoisie that controls the Cuban state. The death of the Maximum Leader occurs at a time when the Cuban state machinery that was resurrected in 1959-60 is entering in another crisis of material reproduction, sunken in investment expenses and social control that makes it unsustainable, but with a popular legitimacy that maintains popularity in spite of all the desertions. The political elites are taking advantage of this peculiar and beneficial situation to dismantle the Cuban welfare state that has existed during the time of Fidel Castro and through the Cold war; “No rush, but without pause”, as General-president Raul Castro said. For this, it seems that they are going to sell the country in pieces in order to sustain the state, preferring to become allies with the big financial groups of the world so they can refinance the debts, moving towards a socialisation of decision-making and control of individual and groups over their lives, that embodies concrete reality rather than an abstraction of propaganda, modest but concrete steps towards collectivisation of daily life and the extinction of the bureaucraticÂ and parasitic state. In the interest of perfection and rationalisation of the capitalist state in Cuba, the heirs of Fidel Castro have two fundamental tools which are also a legacy of Fulgencio Batista. La Central de Trabajadores de Cuba (Workers’ Central Union of Cuba) is a trade union organisation that was born on January of 1939 as a product of the alliance of Batista’s political-military apparatus and the Cuban Stalinists, that today guarantees total control of the workers’ movement by the state. In 1939 a member of the communist party Lazaro PeÃ±a, later known as “The captain of the working class”, was selected by Batista to lead the organising of the alliance. This was the very same person, commissioned by Fidel Castro in 1960, who used his time in office to create a school of opportunists and parasites that yielded a bunch of characters similar to Lazaro PeÃ±a such as Pedro Rosas Leal and Salvador Valdez Mesa, who have dedicated their lives to maintain and continue the legacy of Fulgencio Batista and Fidel Castro to make a socialism under the discipline of government. The Codigo de Defensa Social (Social Defense Code) of April 1939, the key element that portrays the fascist spirit of Batista supporters, is yet another instrument inherited from the Colonel-Sergeant Batista that has been ratified with different names and upheld until the end of Fidel Castro’s rule. Having been put into effect to regulate the death penalty for political crimes and repressive injustice in general, it is a legal element that is interestingly forgotten by all political tendencies whether pro-democratic or pro-dictatorial. The Social Defense Code was not formally annulled by the constitution of 1940, neither in 1976 nor in 1992, and has been maintained because of its usefulness in dealing with social conflicts that will be generated by the dismantling of the Stalinist Cuban welfare state in the coming years. After so many lives were destroyed, in the middle of this alleged antagonism, after so many diabolic tortures that caused dementia and demoralisation, after so many mass executions, bitter exiles, long sentences in horrendous prisons, after so many fiery and sublime speeches, after so much arrogance and intolerance, that it will become more visible with a cynical silence that a refined and unfinished ‘batistano’ spirit will now contribute to what statemen are calling an update of the economic model of Cuban socialism. With the exception of violence and police brutality, that in recentÂ years ago has temporarily become less public and visible in Cuba, all the other factors identified by Landrian from the prior dictatorship remained intact after 1959, reinforced and developed from then until the present day. Â And Landrian and his comrades who wrote for El Libertario were not able to enjoy the freedom of the Fidelist revolution much after May 1960 because they were censored, imprisoned, exiled or forbidden by the new “revolutionary” political police. Repression, embezzlement, tyranny, submission to slavery, centralism, bribery and unconditional servility to the state machinery continued to exist in Cuba after the defeated tyranny of Fulgencio Batista. The personal insights of our comrade Antonio Landrian, that were lost in the tornado of history, became the structural basis of Cuba’s daily functioning right up to the funeral of Fidel Castro. Some of my friends that were in the central park in the city of Artemisa [Havana Province] were kicked out by the police and the agents of State Security after Fidel Castro’s death because “it was not the appropriate time to be in the park chatting”. Students at Havana university, had their rooms closed in the afternoon of 28th of November afterÂ undercover police swarmed in, because “you have to go to Plaza de la RevoluciÃ³n [Revolution Square] or stay on the street until the ceremony finishes”, State public transport in the capital was paralysed on 29th of November from midday to ensure that the public were on the street to be pushed into the mass event at 7.00 p.m. Sports activities in green areas close to any main avenue were forbidden and fines up to 1500 pesos (3 months of salary) were given to anyone caught consuming alcoholic beverages in public on the days of mournin. These are just a tiny sample of the daily procedures of our state defenders of supposed socialism in Cuba. Fidel Castro left a country with one of the highest levels of education, health and quality of life in America, but everything is pierced by the strategic interest of the stable functioning of their state machinery, in the name of the fight against Yankee imperialism and his local their local lackeys. Accomplishing this purpose has given rise to a society that is on the verge of permanent migratory crisis and demographic collapse on the horizon. In this the imperial Yankee politics have have a decisive role, but not least determining that the dictatorship over the Cuban proletariat run by Fidel Castro has converted Cuba into a territory populated with “â€¦ an enormous flock of wage slaves (â€¦.) asking to be slaves so they can improve their life conditions…” Â In any part of the world, this makes a reality of most painful nightmares of the Cuban ex-anarchist Carlos BaliÃ±o in 1897 in his text False Prophecy (Profecia Falsa). This enormous flock of wage slaves, erstwhile revolutionaries, were already living under greater moral and material depravationÂ when Fidel Castro delivered his speech of 1st May 2000 on his latest concept of revolution, saved from oblivion during the time of his funeral, where he assured that, “Revolution means changing everything that must be changed”. Looking back 50 years ago it is pragmatically clear that the omitted subject of that sentence is without any doubt the revolutionary population that once existed; in the year 2000 the omitted subject of that sentence is none other than Fidel Castro himself, with his capacity to manoeuvre and with his imposing ideological-police apparatus. In that year he had shown no shame whatsoever in omitting revolutionary people from the concept of revolution, aware that they had already been castrated of their capacity for reflection and self-determination and, therefore, no longer able to be the subject of a speech, much less to be the subject of their own history. During the long days of official mourning that we are living in, in Cuba, it was becoming increasingly obvious that new expressions were emerging, “I am Fidel!”, expressing very well the condition of collective amputation. And in between that enormous sea of flags, pictures and posters that appeared on T.V., from Santiago de Cuba [Eastern City] there was one poster carried by a woman saying, “I am Fidel, give me your orders”. Such grammatical and existential imbalances will be increasingly frequent in the public’s shock realisation that the arrogant incarnation of power in the history of Cuba has been converted into a single box of ashes, a country that will have to learn to live without the orders of its Commander in Chief. And perhaps to learn along the way that they need neither more commanders nor furtherÂ orders, but rather more fraternity, more self-organisation, less vile and moral misery between those at the bottom, more responsibility for our own lives, more social imagination to defeat the spirit and the representatives of the new Fidelist parasitical and bureaucratic bourgeoisie, who today are restoring capitalism and its old horrors in Cuba right in front of our noses and pretend to be crying when they are really partying. Everything that facilitates this learning will be a direct contribution to the next revolution in Cuba. Anything that hinders its discovery by the people will be the most precise and updated expression of anti-revolution. 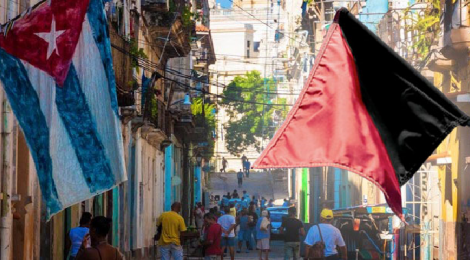 The proportion by which Fidelism succeeds as a ideological current in the future, inside and outside of Cuba, will be an exact expression of how much the moral bankruptcyÂ of authoritarian, statist and progressive leftism in the world has advance, and to what extent they will continue to put on the table the need to keep it going, “how to lay the foundations of the social order of Today, and make others safer, without the house coming down?” as Jose Marti wrote in 1890, reflecting about “â€¦â€¦ that tender and radiant Bakunin”. Â Thanks to a researcher from the U.S., Robert Whitney, we have access to this document that is to be found in the book “Estado y revoluciÃ³n en Cuba” published by the Editorial Ciencias Sociales (Social Â Sciences Editorial), Havana in 2010, p.230. Â All the press of the time covered this news and the researcher Robert Whitney, in the same book mentioned above, page 283, talks about this event using U.S. governmental sources. Â See: U.S. congress archive Mr Grant Watson to Mr Eden, Havana, 2 December 1937. PRO/FO/A/9019/65/14, no.171. JosÃ© MartÃ­ complete works, Volume 12, En los estados Unidos. page. 378, Chapter 34 Desde el Hudson, Â in Editorial Ciencias Sociales, Havana, 1982. [Citing letter from JosÃ© MartÃ­ published in La NaciÃ³n, Buenos Aires, 20 February 1890, written from New York U.S.A. (Nueva York), 9th January 1890].